I was looking to do something different than just sautéing zucchini as a side dish this week & was inspired by the flavors in Ben's Zucchini Bruschetta's. I thought why not take those flavors & turn them into baked dish, which turned into a lasagna using the zucchini as the noodles. This turned out much better than I expected. The zucchini held up well as the "noodles" & because I didn't cook them before using they retained a little bit of a crunch. Usually, we use Italian sausage in lasagna but I had some ground turkey in the freezer which turned out to be a good choice, its mild flavor was a good compliment to the zucchini. For the sauce I used a can of Muir Glen Tomato Sauce (Muir Glen makes the best organic tomato products!) which I doctored with a little fresh oregano & basil from the garden. Then I added some cream to give the sauce a some richness. Use any sauce you like here but I highly recommend a creamy tomato sauce. I'm almost embarrassed to say we ate the whole lasagna in one sitting last night (to be fair it was only 5" x 6). Matt says he would definitely have it again & also thinks leaving out the noodles allows us to have more garlic bread on the side. In a skillet cook the turkey, red pepper flakes, salt to taste, onion & garlic until the turkey is cooked through & the onions are translucent. 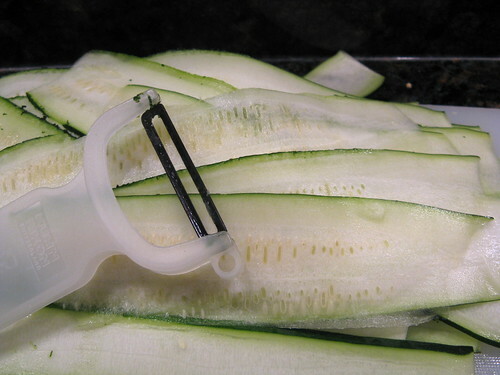 Using a peeler or a mandolin, slice the zucchini lengthwise into thin ribbons. We found a Y peeler to be perfect for this. Spoon just enough tomato sauce onto the bottom of a 5" x 6" baking dish to coat it. Lay 1/3 of the zucchini slices on top of the sauce overlapping as you go. Spoon 1/2 of the turkey mixture on top of the zucchini. Then top with 1/3 of the remaining tomato sauce & sprinkle with 1/4 c of mozzarella. Add another layer of zucchini slices, using 1/2 of what you have left) then the rest of the meat, 1/2 the remaining sauce & 1/4 c mozzarella. 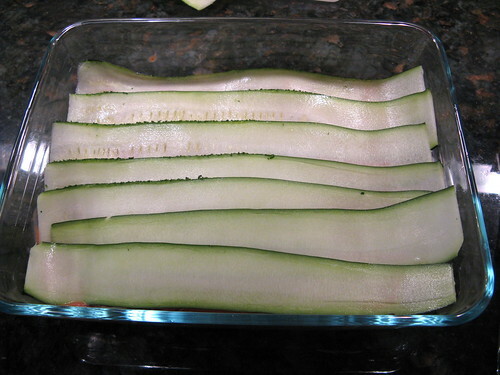 Use the last of the zucchini slices to make one more layer. Top with the remaining tomato sauce & mozzarella & then some grated Parmesan. 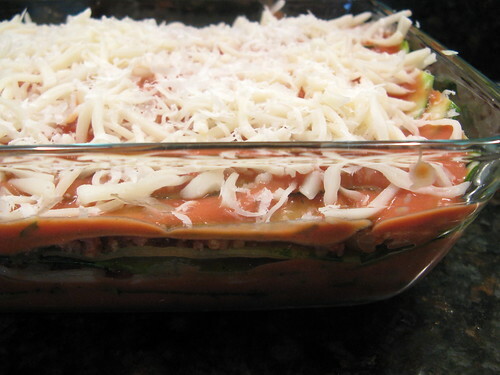 Bake for 45 - 60 minutes until the cheese is melted & brown & the sauce is bubbly. Allow to sit for about 15 minutes before slicing & serving. Serve 2 hungry people or 4 not so hungry. Anything to have more garlic bread!!. 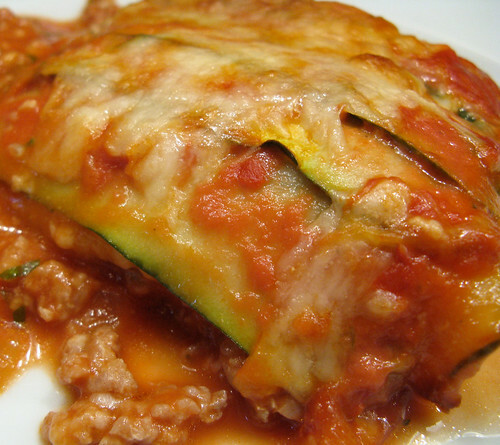 Love the idea of using courgettes as the lasagne sheets. 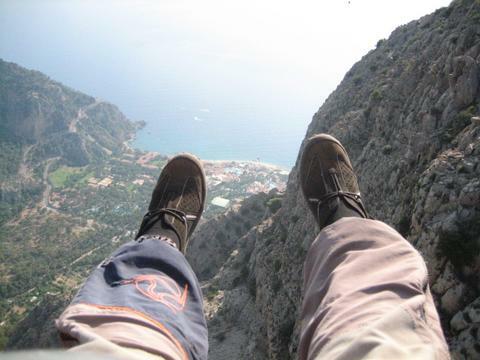 Brillant idea! And without the noodles I wouldnt feel guilty eating it! This looks great and I could eat the whole pan myself! This is going to sound crazy, but now your dish is inspiring me to make something similar for dinner tomorrow night :-p It's just a crazy inspirational cycle :-p The lasagna looks REALLY good! Glad you all liked this idea. Ben - Your cracking me up. Can't wait to see what you make maybe it'll inspire me on to something else. What a great way to lighten up lasagna! I love it! 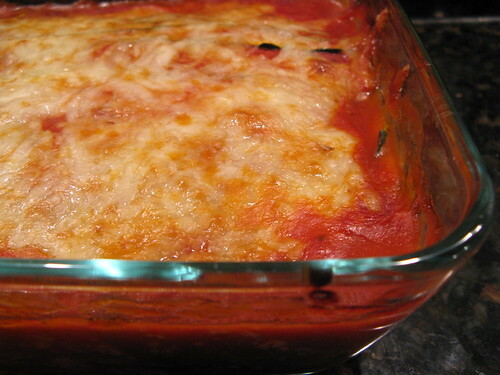 this is such a creative alternative to traditional lasagna - love it! the photo's making me hungry. I agree with the other - great idea! Zucchini instead of pasta is a great way to cut down on carbs. 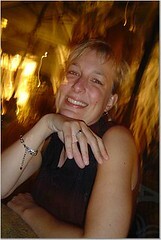 Starred! I made this tonight. I used a cheese slicer that's shaped similar to the Y peeler. I made a double batch and have a ton of leftovers. With the turkey and zucchini, it's really filling. I made garlic bread from Simply Recipes. I made an awesome dinner tonight. This is the second recipe that I've made from the blog. Thanks for all of the cooking inspiration and recipes!